Optimum Security is one of British Columbia’s largest security firms offering comprehensive turn-key security solutions for its wide array of clients in need of exceptional service. We specialize in high-quality, 24/7 commercial and residential security guard services, mobile patrol and alarm response services to keep your property safe. 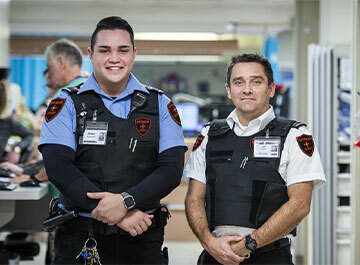 Serving the entire of BC and all of Vancouver Island, you can count on us to bring custom security services that target and fulfill all of your requirements. Our professional security guards are uniformed and fully licensed by the by the Registrar of Security Services. By their presence alone, they can enhance your employee’s safety and reduce the risk of vandalism or theft from your property or at your facility. They bring both intelligence and ability to think quickly and on their feet. We also work in close collaboration with the local law enforcement officials to increase the security of your home or business. Depending on the nature of your business and its vulnerability, your needs may require mobile patrol security to prevent unauthorized access to your site or monitor for signs of suspicious or even threatening behavior regardless of the hour. Our mobile patrol officers are adequately trained to detect any unusual odors, detect leaks and tampering that may be caused naturally or otherwise and act on the situation accordingly. Whether you’re a single industrial building or a multi-campus retail center facility, we provide a range of integrated security systems like Security Systems, Access control, CCTV (Digital and Analog), Fire Alarm Systems, Fire extinguishers, etc. We also understand that a security system is only as good as its monitoring service. Whether you’re at home or away, you can take comfort in knowing that you, your family, property/facility is safe from harm any time of day. When it comes to guaranteeing your property’s safety, you need to work with a security company that consistently delivers professionalism, reliability, and competence. You get the best when you partner with Optimum Security. Contact us today regarding your commercial or residential security needs in British Columbia and feel free to ask more about us and the security solutions we offer.